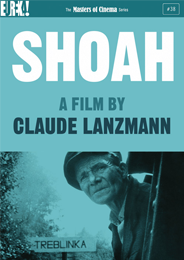 The Masters of Cinema Series is proud to present – for the first time on Blu-ray in the UK – Claude Lanzmann’s landmark documentary about the Holocaust, Shoah, alongside the four films he made through 2013 on the subject. Lanzmann spent twelve years spanning the globe for surviving camp inmates, SS commandants, and eyewitnesses of the “Final Solution”. Without dramatic re-enactment or archival footage – but with extraordinary testimonies – Shoah renders the step-by-step machinery of extermination, and through haunted landscapes and human voices, makes the past come brilliantly alive. Shoah , at 550 minutes, is a work of genius alone, an heroic endeavour to humanise the inhuman, to tell the untellable, and to explore in unprecedented detail the horrors of the past. It is one of the most powerful and important, and greatest, films of all time. A Visitor from the Living  is based on an interview conducted by Lanzmann with Maurice Rossel during the filming of Shoah. A member of the Berlin delegate for the International Committee of the Red Cross from 1942, Rossel was the only member of the organisation to have visited Auschwitz in 1943, and to have also paid a trip to the “model ghetto” of Theresienstadt in June 1944. Sobibór, October 14, 1943, 4PM  recounts the prisoner uprising that took place in the Sobibór death camp in Poland. Only 50 prisoners ultimately evaded capture, while the rest were sent to their murders in the gas chamber. The Karski Report  is Lanzmann’s brief film on Jan Karski, the Polish resistance figure who also featured in the final section of Shoah, and which recounts Karski’s powerful testimonial given to Franklin D. Roosevelt and Supreme Court Justice Felix Frankfurter on what he witnessed during a trip to the Warsaw Ghetto and to the extermination camp Belzec. The Last of the Unjust , at 218 minutes in length, moves between 1975 and 2012, detailing Lanzmann’s mid-’70s Rome interviews with Benjamin Murmelstein, the last President of the Jewish Council in the Theresienstadt ghetto, and the filmmaker’s own return to the location 37 years later — providing an unprecedented insight into the genesis of the “Final Solution”.